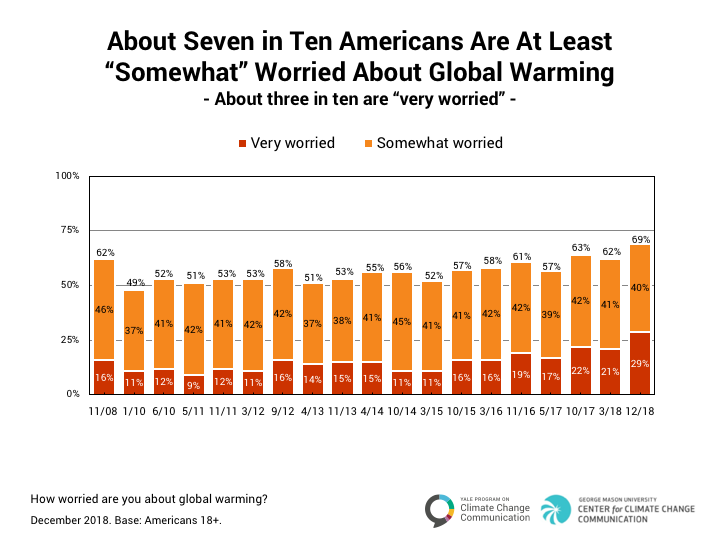 About seven in ten Americans (69%) say they are at least “somewhat worried” about global warming, the highest level since our surveys began in 2008, and an increase of seven percentage points since our previous survey in March 2018. About three in ten Americans (29%) are “very worried,” an eight-point increase since March. 2.2. 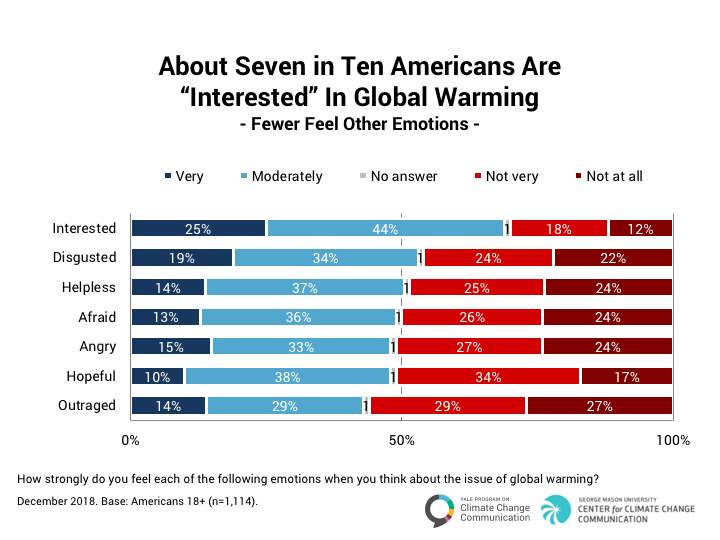 About seven in ten Americans are “interested” in global warming, but fewer feel other emotions. When asked how strongly they feel various emotions when they think about global warming, about seven in ten Americans (69%, +7 percentage points since March 2018) say they feel very or moderately “interested” in it, followed by those who say they feel “disgusted” (53%, +6 points), “helpless” (51%, +6 points), “afraid” (49%, +11 points), “angry” (48%, +9 points), “hopeful” (48%, +7 points), and/or “outraged” (43%, +6 points). Emotional reactions to global warming may be felt for different reasons, and signify different meanings, depending on an individual’s beliefs about global warming. For instance, someone who thinks global warming is happening may feel “disgusted” about it for different reasons than someone who thinks global warming is not happening. For that reason, we looked separately at people’s emotional reactions to global warming depending on whether they think it is happening, don’t know whether it is happening, or think it is not happening. About eight in ten (82%) Americans who think global warming is happening say they are very or moderately “interested” in it. Half, or more, feel negative emotions, including “disgusted” (63%), “helpless” (62%), “afraid” (62%), “angry” (58%), and/or “outraged” (54%). About half feel “hopeful” (52%). 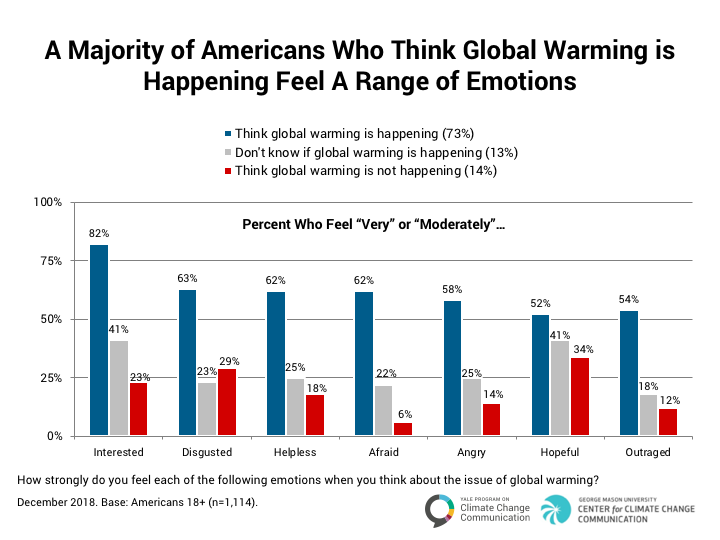 Conversely, relatively few Americans who think global warming isn’t happening feel any emotions about it, the most common being “hopeful” (34%).